The “CBS Weekend News” switched over to a similar graphical look as its parent show, the “CBS Evening News,” which unveiled a new look when Jeff Glor took over as named anchor Monday, Dec. 4, 2017. Anchored by Reena Ninan and Elaine Quijano on Saturday and Sunday respectively, the show’s title card was updated to match Glor’s. Since, however, the weekend edition does not include anchor names in the title, the red box that houses Glor’s name isn’t needed — so instead the red shade is used in one of two strokes in a double underline under the show title, which is rendered in Ridley Grotesk. The open also uses a similar format as the weekday counterpart, with images of both Ninan and Quijano and mixed in. The weekend broadcast’s lower third and other insert graphics were also updated to match the weekday look, with the show’s name also appearing in a narrow banner near the bottom of the screen. “CBS Weekend News” is not produced from Studio 57, the home of “CBS Evening News” and ” CBS This Morning,” but rather from a nearby newsroom set also used primarily by the network’s streaming news service CBSN, with a freestanding video panel filling in for the larger studio’s video walls on weekends. CBS dropped the “Evening News” branding from weekend editions of its signature newscast in May 2016. Though not officially confirmed by the network, the change was largely viewed as a way to both share resources with CBSN (Ninan and Quijano appear prominently on the network at other times) and eliminate the cost of utilizing the larger Studio 57, which typically requires a larger crew and more elaborate graphics. 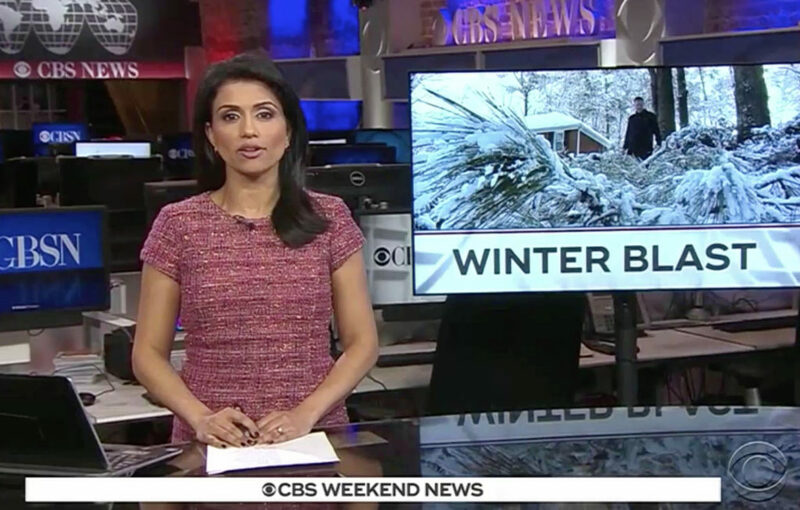 Despite its distinct title, the “CBS Weekend News” can essentially be viewed as the weekend edition of the “CBS Evening News” — it shares the same timeslot in most markets and, as with this new look, branding elements.